Summerfield Stables is a rescue stables and a community group for local children in Hall Green, Yardley Wood and the surrounding areas. It is not a commercial riding stables as our focus is on the rescue and rehabilitation of horses and on providing inclusive riding opportunities for a range of children. We aim for this riding to be accompanied by stable management which we believe is an essential part of keeping a horse. Saturday morning and Sunday sessions are our main activities for stable management and riding. The sessions run from 8.00 to 12.15 but with the option to stay till 3.00 to help with afternoon sessions for some helpers. 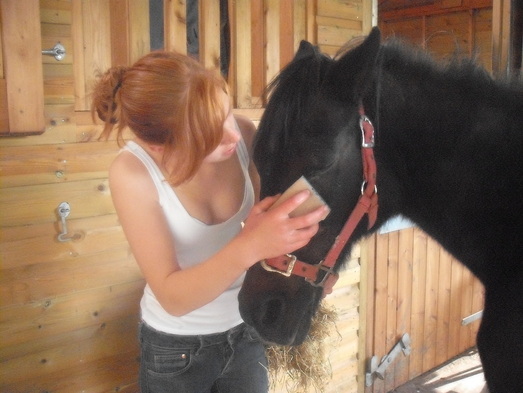 The aim is to teach riders every aspect of horse and pony care. 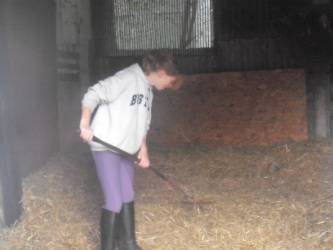 The morning starts with mucking out. The horses are then tacked up and are ridden or lunged. Within the morning there will be three or four group lessons lasting one hour for children and young people to participate in . The sessions are for children between the age of 10 and 16 and aims to be inclusive of a range of children. Most riders need some preliminary beginner sessions to be safe to join in on a Saturday. For safety reasons hair should be tied back and only one pair of stud earings are to be worn. No other facial piercings are to be worn as they may easily be ripped out when working with horses and so represent a serious health and safety risk. Riders must ride every week or every other week and give us at least 24 hours notice if they will be unable to attend. As there are a lot of people waiting to join then it must be understood that if a person does not turn up for a month without correct notification or good reason then it will be assumed that they have left. If anyone who has left wishes to rejoin they will be allowed to do depending on the circumstances under which they left and it is dependent on spaces available. Depending on the time of year they left the stables they may have to rejoin between the start of the school year in the autumn and February so people will not be allowed to leave in the winter and rejoin in the summer as this has become a problem in the past. Please understand that without the riders and volunteers loyalty and financial support the horses would not have a secure home and they rely on you to provide them with this security. Many of them have come from difficult situations and have been taken in because no one else was able to take them. Without the stables there is a good chance they could end up in a similar situation again.